It is so easy to enjoy summer fun and lose track of time and forget to apply or even reapply sunscreen. Not only are sunburns painful, more and more studies show just how dangerous careless sunburns are to long term skin health and overall health in general. Solar radiation includes visible light and it also contains other wavelengths that are invisible to the human eye, such as ultraviolet (UV) light. Ultraviolet A (UVA) is radiation in the 320-400 nanommeter range and ultraviolet B (UVB) radiation is in the 290-320 nanometer range. 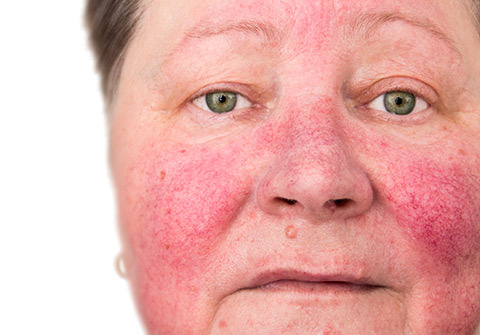 UVB is responsible for most of the redness (erythema) and tanning associated with sun exposure. Prolonged exposure to UVA or UVB increases photoaging. Sunburn is caused by too much exposure to the UVB rays from sunlight. Certain medications (such as some antidepressants, water pills, some types of antibiotics, birth control pills, and medications for controlling your blood sugar) may make your skin more sensitive to the sun, and you may burn more easily. If you take any medications you should talk with your physician or pharmacist about the possibility of increased sensitivity to the sun. An individual’s response to UV radiation is dependent on skin color (or race) and other genetic factors. Blacks and other non-white races are less sensitive to the effects of the sun than are fair-skinned people. They are not immune from the effects of the sun, and may suffer from sunburn. The areas of skin that are exposed to the sun or are not protected with sunscreens and sunblock are most sensitive to sunburn. Noses, the part in your hair, and tips of the ears are particularly sensitive to sunburn. The symptoms of sunburn usually come in about 1 to 24 hours after exposure to the sun, and symptoms peak in 72 hours, unless the burn is very severe. Sunburn may progress from red skin to pain to swelling to skin tenderness and finally, to blisters. Fevers, chills, weakness, and shock may follow if a large part of the body is burned. 1st Degree burns are the most common and are painful and red in color. The outer layers of the epidermis peel in 3-6 days, with itching and redness persisting up to a week or more. Most people have probably experienced this type of itchy, irritating condition several times over their lifetime. Beach vacations, summer fishing expeditions, outdoor crafts fairs, family reunions and such leave many hapless victims with this type of milder sunburn. 2nd Degree burns include all of the same symptoms as the first degree, they too are red and painful but in addition, this more severe burn includes water bubbles. Water bubbles are not only painful, and ugly-looking, they can soil your clothing and bedding, and make if difficult to sit or move in a normal way. 3rd Degree burns are the most serious and dangerous form of sunburn. 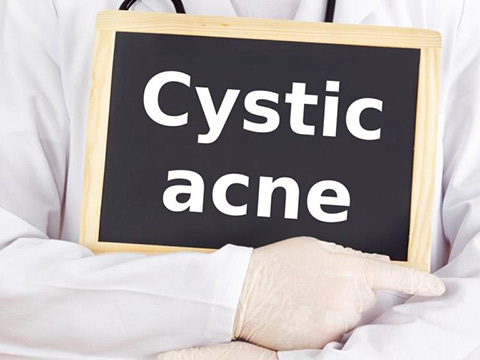 The symptoms are described as painful, red, water filled bubbles and patches of white skin. This type of burn needs medical attention immediately! No one should delay seeking medical attention when white patches are present on the burn area. Third-degree sunburn is rare, and likely requires several days of exposure. Mild sunburn may be treated with over the counter choices, however severe sunburn should be treated by your physician. 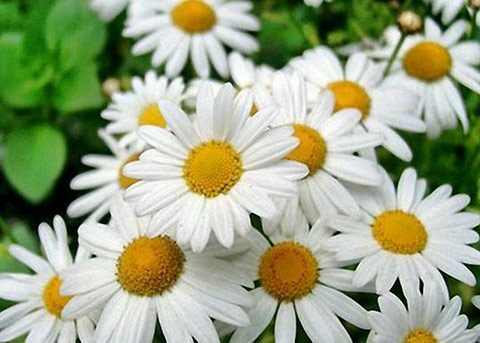 A lukewarm bath with chamomile tea or oil may be very soothing. Soak for about 30 minutes. Avoid taking warm or hot showers or jumping in the hot tub. Hot or even warm water will be excruciatingly painful. The idea is to keep the affected areas cool. Keep the burned areas moist: Gently apply aloe, but avoid rubbing the area as you apply the moisturizer. Aloe vera being a good natural remedy for the pain of sunburn. Moisturising layer of aloe vera will be most effective when you leave it on the burn for as long as possible. This can be difficult if you have an extensive area of sunburn. Be sure to use 100% pure aloe vera. The ideal situation would be to have the actual plant handy, split one of the thick, succulent leaves and squeeze the gel out onto the sunburn. That would be as fresh and pure as you could get, but since most of us probably don’t have access to the plant itself, we may have to resort to a commercial aloe vera preparation. Avoid products that use citric acid or similar ingredients as a preservative, as this could ’sting’ when applied to the burn. Cold compresses may help to relieve the pain of sunburn. Stay hydrated: Drink plenty of fluids because sunburn will dehydrate your body. By fluids, we mean water and juices. Avoid soft drinks and alcohol including beer as these will only add to the dehydration you have suffered from the sunburn. You should drink 6 to 8 8oz glasses of water daily. Another method of sunburn relief comes from natural tea. This is achieved by brewing cold tea. Applying compresses drenched in the tea does help. It works as an antioxidant and draws the burn out of the skin. It may also act as a temporary pain reliever due to the cooling sensations. Apply ointments: Ointments can speed up the healing and reduce the pain and swelling. Apply a low dose of about 0.5 to 1 percent of hydrocortisone ointment on treatment area. Take anti-inflammatory medication: This will reduce the inflammation and redness on your skin caused by the sunburn. Take aspirin, naproxen or ibuprofen (Advil, Motrin, others) on a regular basis, according to the label. Take only as directed on the label, and take only until the redness and swelling begin to go away. Take painkillers: This will help relieve the pain. Take Paracetamols which can reduce the pain and cure fever caused by the sunburn. Wash the sunburned areas with an antibacterial soap. This will hopefully prevent a secondary infection. Do not use any oil based products, butter, petroleum jelly, or substance that can clog the pores, trap the heat, and cause the burn to go deeper. Typically, it takes about seven days to get over a sunburn. 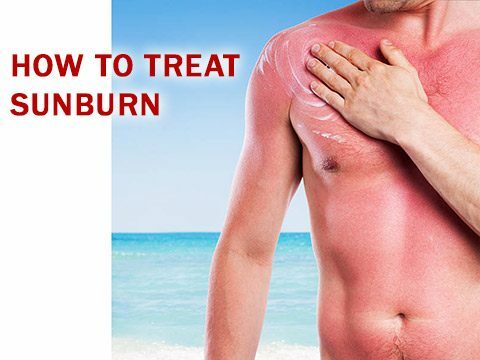 Consult a medical professional if the sunburn covers a large part of your body, doesn’t improve within a few days, or you have severe pain or high fever. The above first aide measures are not meant to be a severe sunburn treatment, for dangerous and severe burns, you must seek the aide of your Doctor. The best way to treat sunburn is to prevent sunburn. If you must sit in the sun, start sunning slowly, no more than 30 minutes between 10am and 3pm. Skin that has been burned is very sensitive to the sun for up to several weeks. Avoid the sun until the sunburn is healed so that you do not damage the new skin. Keep in mind that some medications will increase your sensitivity to the sun – you will burn quicker and easier.